Susie wanted tattoos from the age of five or six. She also dreamt of being a biker. By eighteen she had her first tattoo and by nineteen had four. She just loves them and has many more now. Next she plans a black backpiece composed of a lot of writing. Her tattooist is Andy Barber in New Malden in London. (www.andybarbertattooandpiercing.co.uk.) She's got to that dangerous point now where she sees bare skin as a gap. I wonder just how far she will go. And the bike? Well that never happened. As an adult she decided she was too clumsy to take that on. Anyhow she is a nurse by profession and sees how risky being a biker can be. 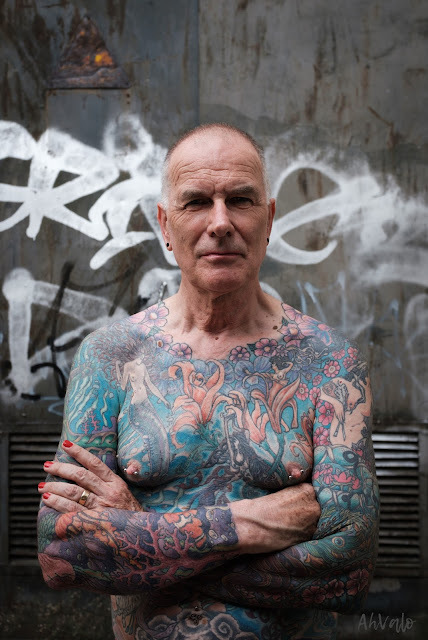 My mind is focussed on just one kind of extreme body modification - heavy tattooing. My body appearance has changed drastically in the past five years. But what are other people's body modifications of choice? One is a practice known as "tight lacing", in which the users of corsets embark on reducing their waist sizes to as small at 17 or 18 inches, if they can. It's not something that grabs me but Lacie here (www.staylace.com) has dedicated herself to the practice. There are others like her who take it very seriously. It's a fetish and not necessarily permanent. If you give up regularly wearing this special kind of corset then you will eventually revert to normal. I have no plans to embark on this myself, but before I pass any judgement must reflect that what I am doing to myself is even more extreme. The images here are truly eye catching. I have never knowingly met anyone who is into tight lacing yet there is a big community out there who do it. These photos were taken by Susanna Ahvalo from Finland and were shot in Vilnius. Susanna is a professional photographer and there is nothing pornographic about her work. I am always happy to have some professional photos taken of my tattooed body. Had they been taken later this month you would have seen my left leg with its new tattoos. Ah well, I can't have everything. A couple tattooed together stay together?